This was not the first such sign that had been spotted at a WWE taping; Kotaku even covered another one last spring. But the sign alone wasn’t the interesting part: What escalated this incident is the fact that Cartoon Network actually turned it into a brief bumper that it aired on television during its Adult Swim programming block a week later. “After eleven years it’s time to translate this game,” read the on-screen caption. I couldn’t agree more. Mother 3's moment is now, and now is the time for Nintendo to finally release this game outside of Japan. Mother 3 (as if you didn’t know!) is the sequel to the Super NES role-playing game EarthBound, originally released in 2006 for Game Boy Advance. Like its predecessor, it’s a charmingly-written, imaginative, quirky RPG with a heart of gold and a touching story of families and aliens. It’s got a wonderful turn-based battle system in which you can do more damage to enemies by tapping along to the rhythm of the music. In Japan, where its writer Shigesato Itoi was a household name, Mother 2 was regarded as one of the indispensable masterpieces of the Super Famicom era. But in 2006, EarthBound was still very much a niche, cult game in the West. It had tanked upon its initial 1995 release in the U.S., where the RPG genre had yet to take hold, and had never been released in Europe. So it’s understandable that on its release, Nintendo would look at Mother 3 and decide that it would perform poorly outside Japan. Those of us who were asking for it at the time realized that we were likely entreating Nintendo to translate a niche game. ﻿We are at peak EarthBound, but this moment will not last forever. Mother 3 was a Game Boy Advance game, but its aesthetic is patterned after the Super Nintendo’s pixel-art style, which is enjoying more cultural cachet than ever. Witness the colossal reaction to this week’s announcement of the SNES Classic hardware—which includes EarthBound as one of its 21 built-in games. Although UNDERTALE is an original game, the demo has already received many favorable comparisons to the MOTHER (Earthbound) series, specifically MOTHER 3. So a smash hit game (about 2.5 million copies on Steam so far) that explicitly referenced Mother 3 in its pitch is coming to Sony platforms, but the actual Mother 3 is MIA. Undertale is hardly the only game inspired by Nintendo’s classic. When asked in 2013 what games inspired South Park: The Stick of Truth, Trey Parker quickly name-checked EarthBound. 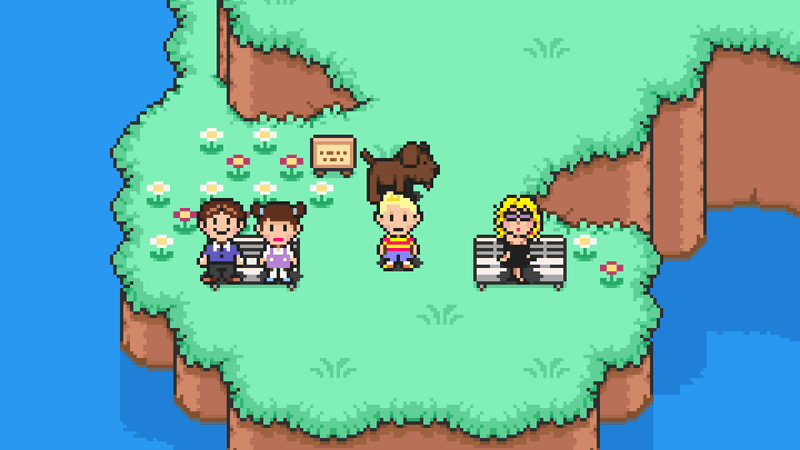 We’re living in an EarthBound world, and the only thing missing is the game’s actual sequel. It’s bizarre. Kotaku editor-in-chief Stephen Totilo and I have both been independently bugging Nintendo of America president Reggie Fils-Aime about Mother 3 for a decade, to the point where it was once parodied in an E3 press conference. But for most of that decade, asking for Mother 3 meant asking Nintendo to create an entirely new version of the game, since there was no Game Boy Advance emulation available. When the game was released on Wii U in Japan at the tail end of 2015, things suddenly got much more feasible, but it was still not to be. And frankly, given how badly Wii U failed, translating that version of Mother 3 would have been a sales nightmare no matter how you sliced it. But Nintendo has no problem biding its time. It will sit on finished products to release them at the opportune moment where it can generate the most interest. Note its use of the previously-unreleased Star Fox 2 for the launch of SNES Classic. So all we can hope is that its plans for classic game content on the Switch are ones in which a translated version of Mother 3 would dovetail nicely. I’m not sure if it would make sense to use it as a carrot to attract people to its paid subscription service that it’s launching in 2018, which will include a Netflix-style library of old games. Maybe a better way to do it would be on a physical cartridge—EarthBound Anthology, if you will. The entire trilogy, with bonus content. It could even work with the Ness and Lucas Amiibos. This would also give Nintendo the opportunity to create collector’s edition versions, to increase the return on its investment. We are past the tipping point on this. When a major television network is using its on-air time to ask you to localize a game, it might be time to localize that game. Mother 3 might have been a tough ask 10 years ago, but today it’s unbelievable that there exists a sequel to EarthBound that has never been released outside Japan. We are at peak EarthBound, but this moment will not last forever. The time for Mother 3 is now.